I have a slight obsession with stationary and cards, I have a small box full of all different sorts of cards and some stationary but nothing personalized. Babadoo Designs offers personalized stationary, invitations, announcements and other gifts. I am not good at picking just one design so it was a little difficult to choose a set of stationary to order. 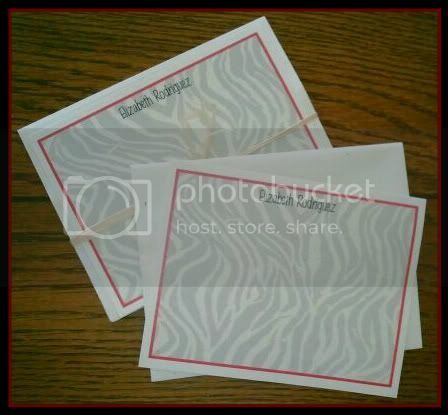 I finally decided on the really neat zebra printed background with a border of deep red. I was sent four cards and four envelops of personalized stationary to review. I wish I had more of course but I will use these only for something very special. Babadoo Designs uses quality paper and ink, the best thing is the paper is 100% recycled. That makes me happy, it's funny my family calls me a tree hugger, which is fine by me! All the designs used come from a watercolor painting and are transferred to the product. Babadoo Designs are unique and you will not find them anywhere else. If you are interested in ordering personalized stationary or other products then I recommend visiting Babadoo Designs. You can also find Babadoo Designs on Facebook and Twitter @BabadooDesigns.